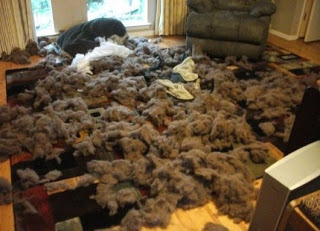 It is a behavior that manifests itself as visible stress upon departure of a dog's person. The anxiety can vary from mild to severe. Separation anxiety is preventable and responds well when treated. By nature, dogs are social animals – they don't like being alone. Many dogs who are in stable, structured homes will never suffer from separation anxiety, even if their people go off to work every day. In some dogs, however, being alone for many hours a day causes undue stress, boredom, and… anxiety. In turn, they look for things to do. Are there triggers for Separation Anxiety? If you are making preparations to leave, the dog may follow you from room to room. Other signs are pacing, excessive salivating, vomiting, barking, howling or whining. During your absence, your dog may engage in destructive behavior, often directed at the exits (windows and doors) or clothing or other items that have your scent. 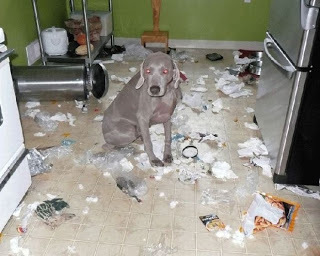 An otherwise house-trained dog may eliminate inappropriately. In severe cases, the dog may have a panic attack and hurt herself by breaking through windows or attempting to get out of her crate. As always, any change in your dogs behavior warrants a visit to the veterinarian to check your dog's health.